Messy magic rabbit in hat card with splodges and scribbles. 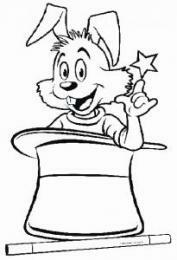 A blank plain card turns it into a black and white line drawing of a rabbit in a hat after the children pretend to draw the picture in the air. The children will not be happy with this so the picture is coloured in by getting all the children to throw the colours at the picture. Magician pretends some of the colours hit them in the face as the children giggle !!! On taking the rabbit in hat picture out, it is seen to be all messed up and scribbled on and looks an awful mess ! Eventually the children paint the colours on the rabbit in hat in the air and magically change the messy picture into a beautiful full colour, glossy picture to give out to a lucky helper at the end of the trick. A personal message or magicians contact details etc can very easily be printed on to the inside of the card with most modern day home printers. Packs of the Rabbit in hat design card giveaway refills are available separately. Refill cards for the Potty Painting magic trick. 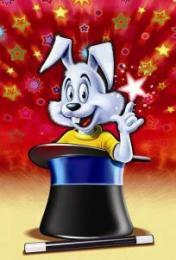 Quality card stock with magic rabbit in a hat design. Birthday childs name and magicians details can be effortlessly printed inside with most modern day home printers. Each pack has 30 refill cards. 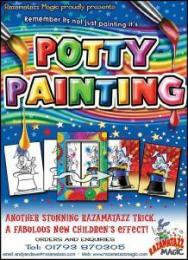 Alternative refill cards for the Potty Painting magic trick. Quality card stock and beautiful high quality printed Rudolph and Christmas tree. Each pack has 30 refill cards.Please note that Rudolph gimmick cards are required to use these cards. All images are copyrighted to Razamatazz Magic. New give away clown refill cards for the Potty Painting magic trick. Quality card stock and beautiful high quality printed magical clown design. Birthday childs name and magicians details can be effortlessly printed inside with most modern day home printers. Each pack has 30 refill cards. All images are copyright to Razamatazz Magic. Spare Clown gimmick card set for the Potty Painting magic trick are also available.The complete spare set includes the main envelope, a blank card, a black & white line drawing card and finally a messed up card covered with pretend paint splats. Please note, all images are copyright to Razamatazz Magic.